Looking to make that England record unbeatable. Rashford's got a chance at current rate though! He's going to surpass Charlton this season for sure because he's going to get penalties and other opportunities. I think even without penalties he'll cruise past Charltons record this season. I do think he'll get more goals this season in a number 10 role. I have my doubts whether he'll pass Shearers EPL record as 67 is a large deficit and he'd have to play at the top for maybe 4-5 seasons. But you never know! Yeah there's very little chance he surpasses Shearers record... But he'll definitely go past Charlton's and fair play to him for that! Yesterday's goal was a record-equalling 87th Premier League away goal. I think Rooney gets a bad rap from fans, when he should be appreciated. He is about to become to leading run scorer for us, as well as for England. And he could even end up as the leading EPL scorer, although that is a push. Sure he can be infuriating and poor, however I do think when he is now surrounded by better players he will flourish. Absolute tosh when he came on but he can still deliver those sprinkles of quality. A fantastic achievement and it won't be surpassed for a very long time. He remains a very good player but I don't think an in and out role suits him at all. He has always been a player who has thrived on runs of games. Obviously he's not the player he was but still a decent squad player to have. Wow! What a way to do it. Glad it's out the way now and he can maybe contribute a bit more to this season. Been a really great player for us. History made. Loved his attitude after scoring. Was more interested in the points than the record. I am glad he has scored that goal just to stop the commentators going on about it. The first comment about it today was after 24 seconds of a game he didn't start. As for Wayne himself I don't think he played well but it was a top goal. His attitude has been good to not playing and I genuinely think to him the results are more important than his record. Yeah commentary has been very annoying recently. Think he should start on Thursday. Sir Bobby Charlton told ManUtd.com: "It’s over 40 years since I scored the last of my 249 goals for Manchester United, so I must admit that I have become used to the honour of being the club’s all-time top goalscorer! "We have had some incredible strikers here at Old Trafford and they have scored a lot of goals, but it has been fairly obvious for a while now that Wayne Rooney was going to be the one likeliest to break my record, and now that day has come, I would be lying to say that I’m not disappointed to have lost the record. However, I can honestly say that I’m delighted for Wayne. He deserves his place in the history books. "I was 35 when I retired. Wayne is only 31 and still going strong, so I don’t think he’s done by a long stretch yet. He continues to show that he can contribute goals, assists and performances whenever called upon, he will raise the bar even further before he calls it a day. Now he’s the man to beat, and I can’t see anybody doing that for a long, long time." Rooney the record-breaker was signed by Sir Alex Ferguson at the age of 18 after rising to stardom at Everton and has been a consistent contributor to the Reds' scoresheet since netting a hat-trick on his debut, in the 6-2 Champions League victory over Fenerbahce on 28 September 2004. Sir Alex told ManUtd.com: "I would like to say huge congratulations to Wayne on reaching this milestone. It is no mean feat to score so many goals and he breaks a record that has stood for over 40 years. Wayne thoroughly deserves his place in the history books of this great club and I am sure that he will go on to score many more goals. Well done Wayne, I am absolutely delighted for you, you have been a great servant to this club and long may it continue." Rooney, now aged 31, equalled Sir Bobby's long-standing record of 249 United goals when he opened the scoring against Reading in the FA Cup third round earlier this month. 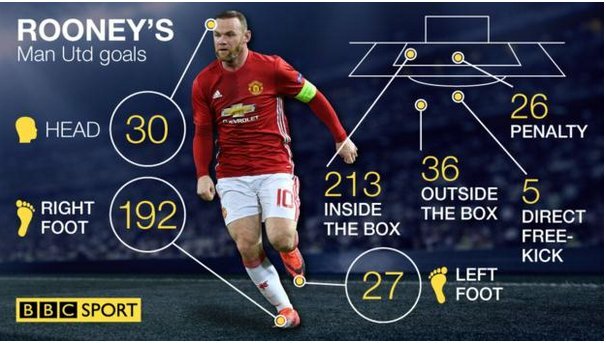 The stage seemed to have been set when Rooney started against Hull City in the EFL Cup and came on at half-time against Liverpool last weekend but, although it wasn't to be against our arch-rivals, he has now achieved the feat to write his name in the club's history for years to come. Congratulations to Wayne from everyone at the club. Certainly a huge well done and congratulations to Wayne Rooney. A hugely impressive feat that he's managed despite the ups and downs over the past few weeks and certainly even years. It's seemed inevitable for some time now that he was going to do it but still what a goal to do it with! And what an important goal too... With Liverpool losing that's actually a point gained on them! Whilst we didn't lose any ground on Spurs or Citeh. Happy for him. You don't break records if your a mediocre player.